Information Only playable in combination with the Magic Voice. 3.57 points at 7 votes (rank 842). 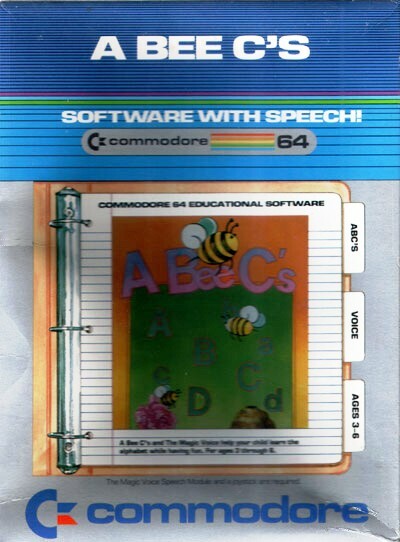 The cartridge A Bee C's by Commodore can only be played with the Magic Voice Speech Cartridge. The educational programme was recommended for children the age of 3-6 years. It is for learning the alphabet, so to recognize the small and he capital letters and to spell them. A bee leads through the game, which can be controlled with the joystick in port 1. At first, you are greeted by the bee. 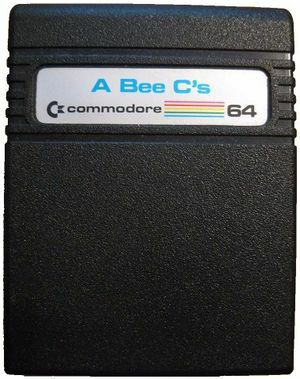 She flies with a humming noise over the screen and says "Hi, I'm the Commodore Bee". Then an explanation follows that you need to fly the bee either to the rose, to play, or to the beehive to learn the alphabet. When you have flown the bee to the corresponding place, you need to press the fire button on the joystick. There are two different game variations. In the first one four pairs of letters (each the capital and the small letter) are shown scattered on the screen. In the second version 8 randomly chosen letters appear on the screen. In both cases the bee asks for a letter that you need to recognize and select. When the answer is correct this is awarded with a happy face and a spoken praise. By flying to the beehive you can repeat the letter, with choosing the rose you get to the next 8 letters. Here, the alphabet is taught. The bee flies from left to right over the screen and at the same time the letters are shown one after the other and spoken out while appearing. When the bee has flown the first line (A-E), it flies back to the left to build up the next line (F-J). After spelling the alphabet completely, this is repeated with the small letters. The graphics is limited to the minimum, whereby also the text is shown by graphics. The start screen greets one with the almost obligatory designation "Commodore presents" (text and voice) and a short part of the tune of "Twinkle, Twinkle, Little Star". At the same time the bee flies with a humming noise to the word "Bee". In the game, sound is limited to the humming, when the bee is moved. Altogether very simple, at least the bee's wings are animated. The game was released only as Cartridge. To play you need a joystick and the Magic Voice Speech Cartridge. This is probably the reason why it is not so wide-spread. There is actually no solution to the game, the learning and gaming part is absolved without any time pressure (parts can also be jumped) and then the cartridge starts anew. Stefan67: "Even for the target group aged 3 to 6 will this game get boring very quickly". H.T.W: "The basic idea of this educating game is in my opinion very good, due to the optical (vowels are highlighted) AND the acoustically accentuation with language. Furthermore, at that time is was actually almost utopian that a computer talks to its user. Unfortunately, the appeal of this type of educational help was given away by the rather rigid guidance through the game and only little diversification. Nevertheless it is likeable and even 28 years later gets still a "good" as evaluation". A highscore is not possible. This page was last modified on 24 September 2017, at 13:30. This page has been accessed 1,809 times.